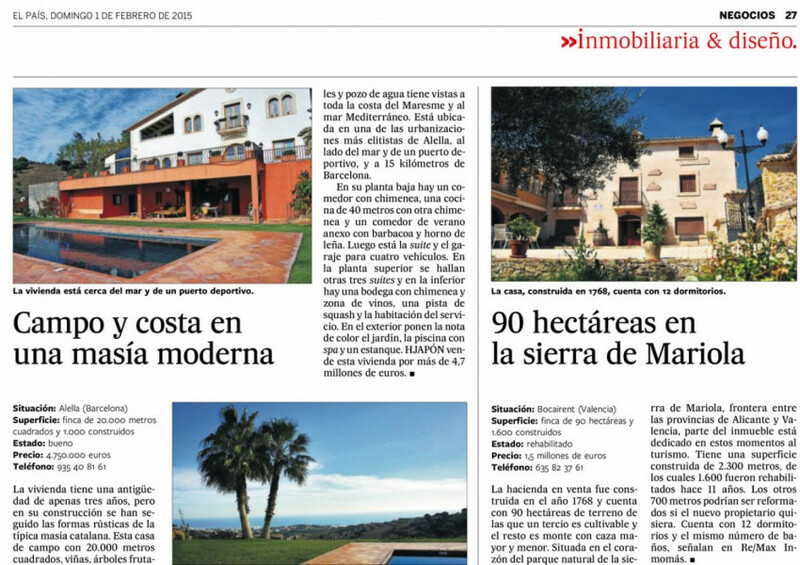 Once again, El País newspaper, on its economy section and in the page devoted to singular houses in Spain, has chosen one of our houses that are luxurious and singular. On this occasion a house promoted by our real state agency, HJAPON, has been chosen. The house reminds of a Catalan Masía, for its style and design. HJAPON is a real state agency with international presence that promotes real estate in Barcelona, el Maresme coast and several other areas in Spain. On this occasion we are talking of a luxury villa for sale in the beautiful area of Alella. This rustic luxury house is newly built and has high-quality finishes. It is divided into three comfortable floors with stunning views onto the coast of Barcelona and the Mediterranean Sea. Outside the property there is a garden with trees and swimming pool with Jacuzzi and breathtaking views onto the vineyards and the sea. This exclusive luxury singular house of rustic design for sale is located in the town of Alella, in el Maresme coast, just 15 minutes away from Barcelona city centre. This is one of the most coveted areas as it is really close to the main city of Catalonia and enjoys a unique microclimate. It is also close to several prestigious shops, wine cellars, restaurants and exclusive international schools and famous sports complex such as the golf club, the horse centre and the tennis club. The house is also near the Masnou and Llavaneras marinas. The property is well communicated with Barcelona and Girona Costa Brava, either by train or by car, and with the rest of Spain and Europe, thanks to El Prat and Girona International Airports.